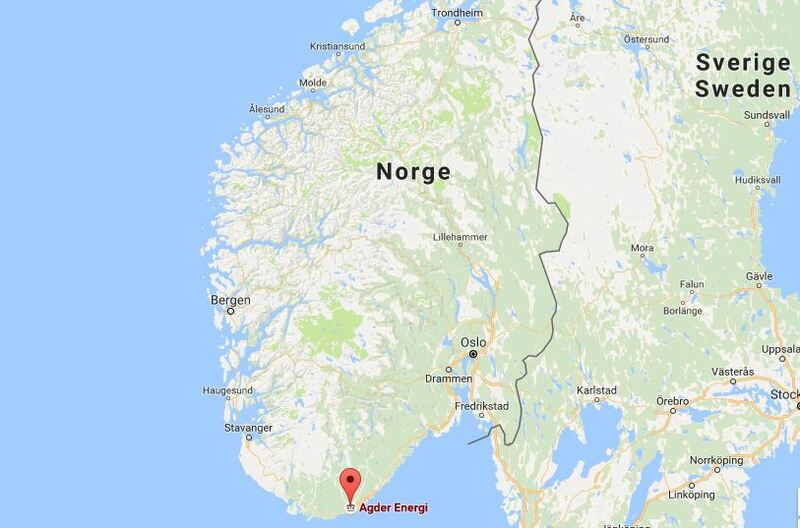 The headquarters of Agder Energi is located at Kjoita (58.15°N, 8.00°E) close to the city of Kristiansand in South of Norway. An overview of the building site is shown below. 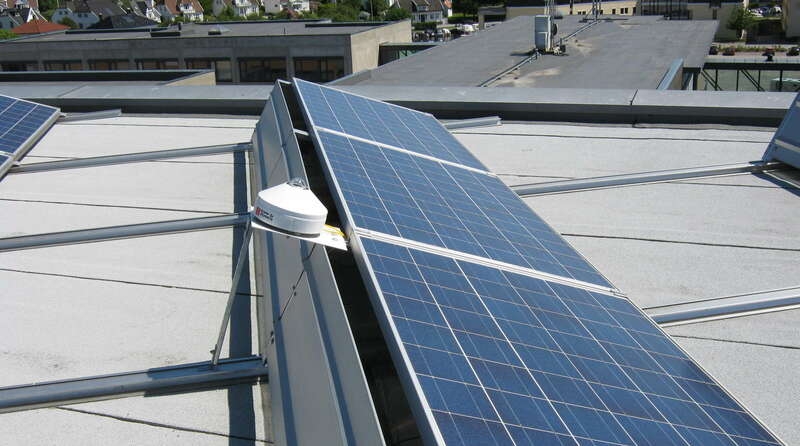 The PV system is mounted on top of a flat-roof building, and may be classified as a ventilated building-added system. 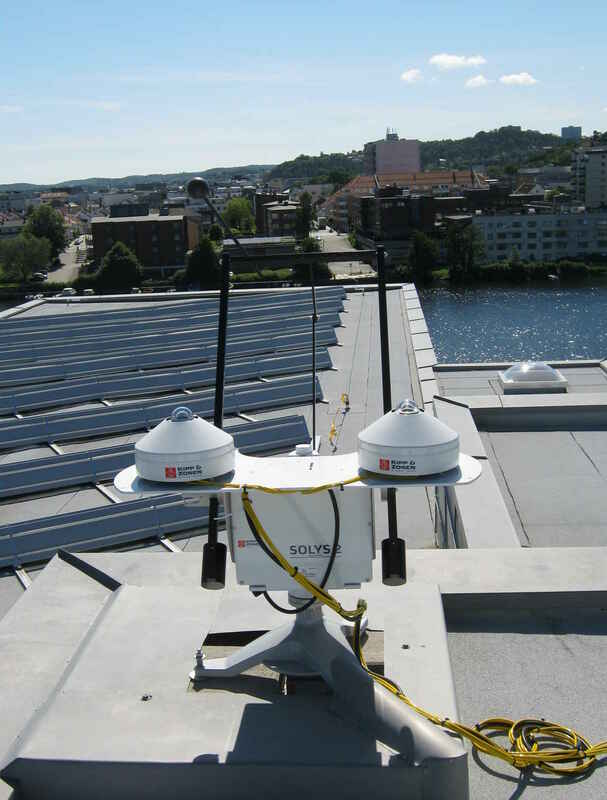 The Kjoita system is one of the first grid-connected BAPV systems in Norway. It has been in operation since May 2011 and was instrumented for monitoring and research purposes in May 2012. The longer the time-series of recorded irradiation and PV-production data, the more representative the results will be, taking into account variability caused by weather variations and planned/unplanned downtime (maintenance, lightning/fuse breakage, etc). Irradiation sensors: 3 x Kipp&Zonen CMP 11 secondary standard pyranometers with CVF3 ventilation units, measuring global tilted (GTI), global horizontal (GHI), and diffuse horizontal (DHI) irradiation. The GHI and DHI pyranometers are mounted on a Kipp&Zonen SOLYS2 two-axis tracker with shading ball assembly. PV temperature sensors: 6 x Campbell Scientific 110 PV surface temperature probes, mounted at the back of representative modules for the different PV technologies. Sensors for auxiliary weather data: An R.M.Young 5103 instrument from Campbell Scientific measures wind speed and direction, as well as ambient temperature. 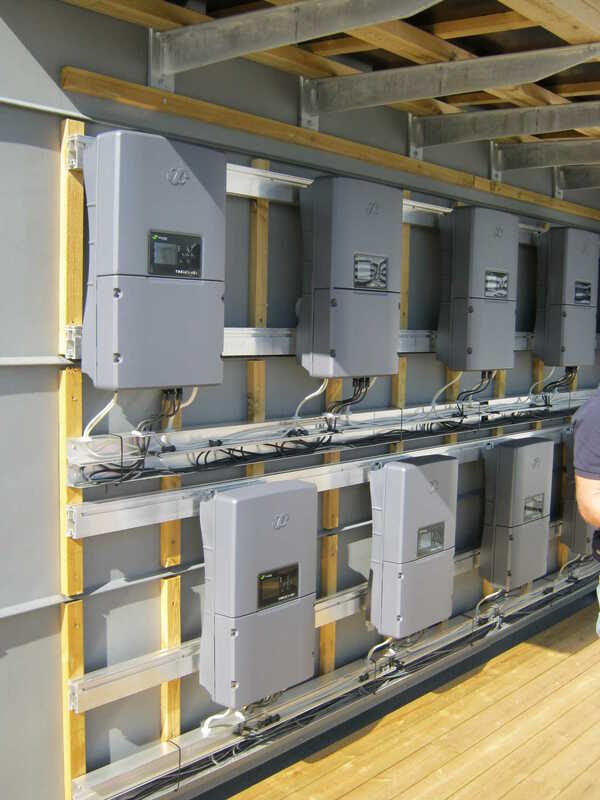 PV array current and voltage sensors: DC and AC current and voltage transducers from LEM and Phoenix measure three PV arrays (REC, Suntech, Sharp). Datalogging system: Campbell Scientific Datalogger CR1000 with AM416 Multiplexer. Data transfer: High-resolution data (down to 1 second) are stored locally on a computer. Minute-data is transferred every 15 minutes to a central database via the internet, and can be accessed via ftp or viewed and downloaded online via LoggerNet web-interface. 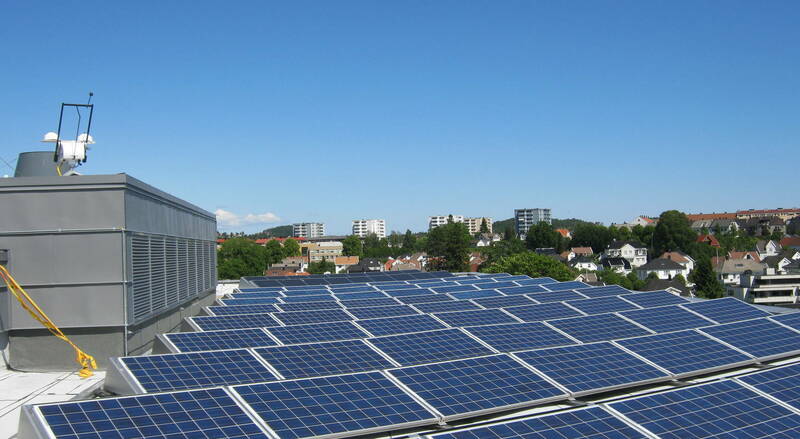 (i) 166 modules of 225 Wp REC PE-series (Eff_STC = 13.6 %) made from standard multicrystalline silicon material (37.4 kWp). (ii) 24 modules of 225 Wp Suntech STP225-20/Wd (Eff_STC = 13.6 %) from Elkem Solar Silicon (ESS) multicrystalline silicon material (5.4 kWp). (iii) 18 modules of 135 Wp Sharp NA-series (Eff_STC = 9.5 %) made from amorphous/micromorphous silicon material (2.4 kWp). 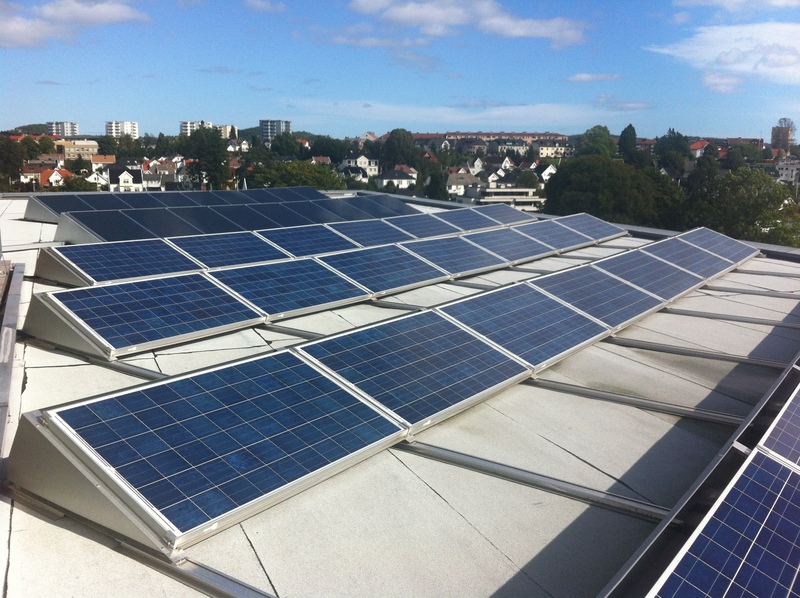 The total installed DC system power is 45 kWp, producing an AC power of around 40 kWp. The installed inverters are of type Eltek Theia 4.4HE-t (4.4 kWp AC). Due to observed peak power capping, the maximum rating of the inverters were adjusted in January 2013 by means of software updates to a higher peak power level of 4.6 kWp for the 8 multi-Si inverters, while the thin film inverter was replaced with a smaller 2.9 kWp unit of the same type. This ensured better matching with each PV array peak power rating. The ratio of rated power of the inverter to PV STC-power is now around 1.2 for the crystalline silicon arrays, and 0.8 for the thin film array. The one-phase inverters are connected up to the three-phase 230 VAC main grid using three inverters per phase. The inverters are galvanically isolated and operate at an EU-efficiency of 96.9 % (96.2 % for the 2.9 kWp unit). 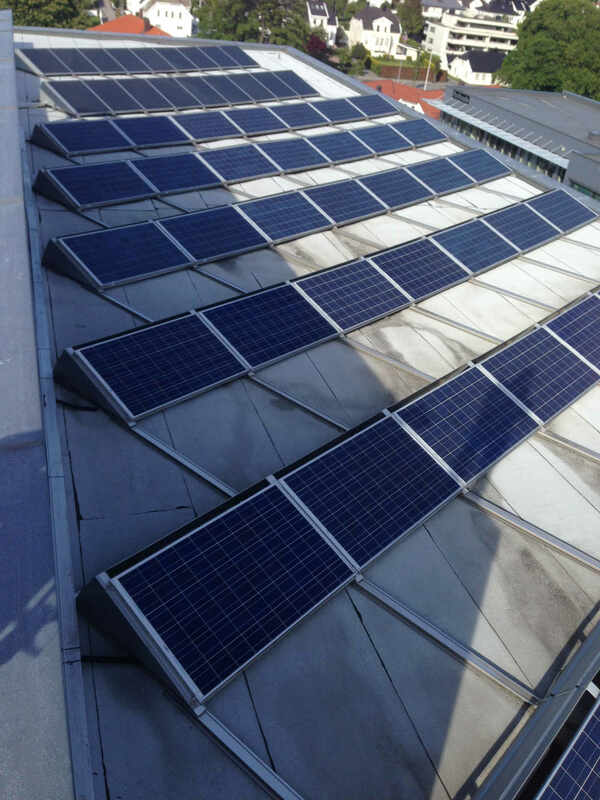 Due to the possibility of high wind loads and mounting restrictions for the PV roof support structures (i.e., no roof penetration is allowed, to prevent water leakage), the tilt angle of the PV modules was set to 20°. This is around half of the recommended tilt angle for optimum annual power production for this location. The azimuthal orientation is south with an offset 20° towards west. 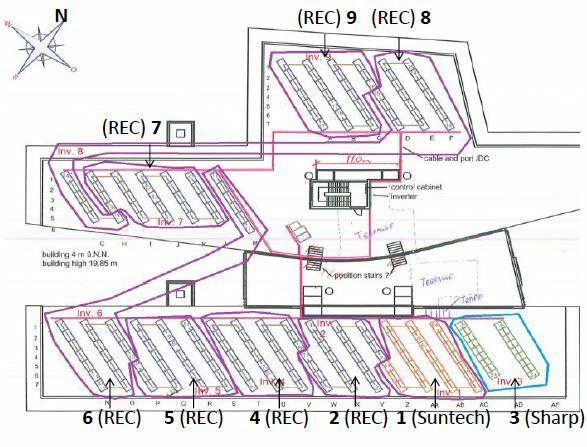 At Agder Energi, the design process for the optimal electrical connection of the PV arrays resulted in 18 strings (two per inverter), as seen in the figure below. Some of the existing roof features (ventilation ducts, antennaes, etc) result in partial shading of some PV arrays at certain solar positions. 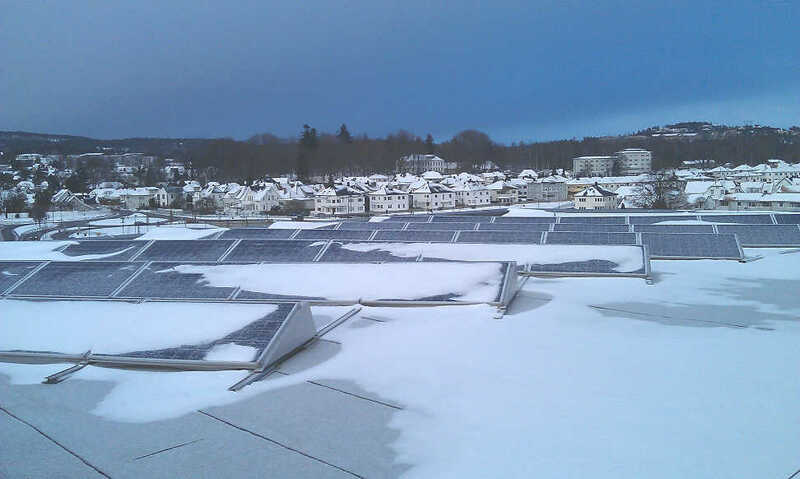 Although detrimental for the performance, this is a typical situation for many buildings that are retrofitted with PV. During the winter months, snow may also cause partial shading. It is therefore of interest to evaluate the actual performance including influences that such non-ideal conditions will incur. Based on PVsyst design simulations, the expected annual power production was around 40 MWh (885 kWh/kWp), assuming a typical meteorological year with annual global horizontal insolation around 1000 kWh/m2. Actual production has exceeded this (see results below). All PV-power is used on-site, as the energy consumption of the headquarters is always substantially greater than the PV production. 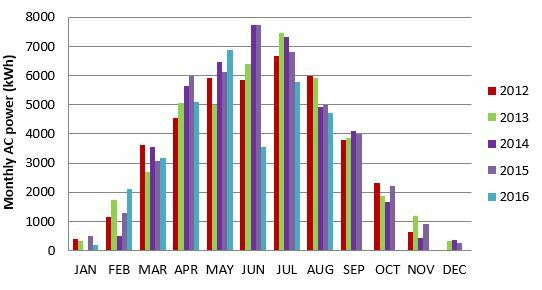 The figure below displays the monthly production (AC from the inverter) of the PV system at Kjoita. An example of the influence of downtime can be seen in Jun-2016, in this case due to circuit breakers (tripped by e.g. lightening or el-fault) that had to be manually switched. Without continuous supervision and follow-up, such faults may result in substantial production loss. The table gives the annual production, specific yield and performance ratio based on the collected data. Agder Energi, Agder Energi Nett, Elkem Solar, Eltek, University of Agder, and Teknova. 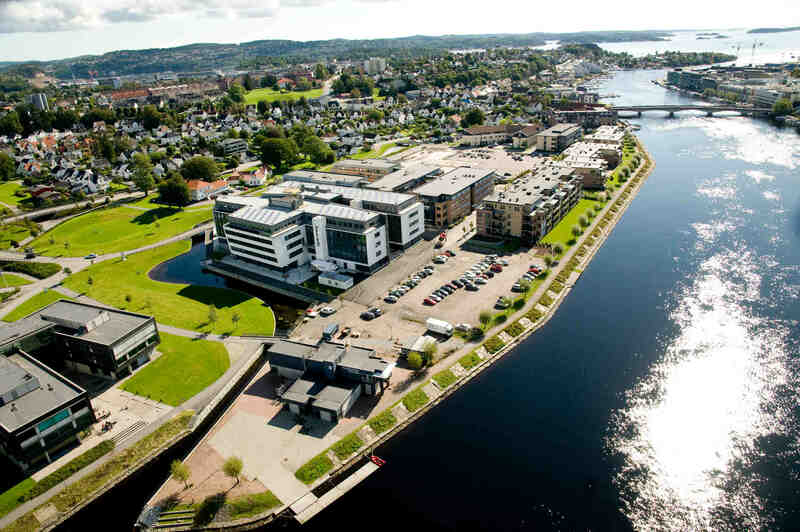 For more information, see the publication "Performance of grid-connected PV system in Southern Norway" presented at the IEEE PVSC 2015 conference or contact Teknova AS.